Receiving some very happy news in June of 2018! Like every year that passes, 2018 was filled with little ups and downs as well as moments of great joy and sadness. 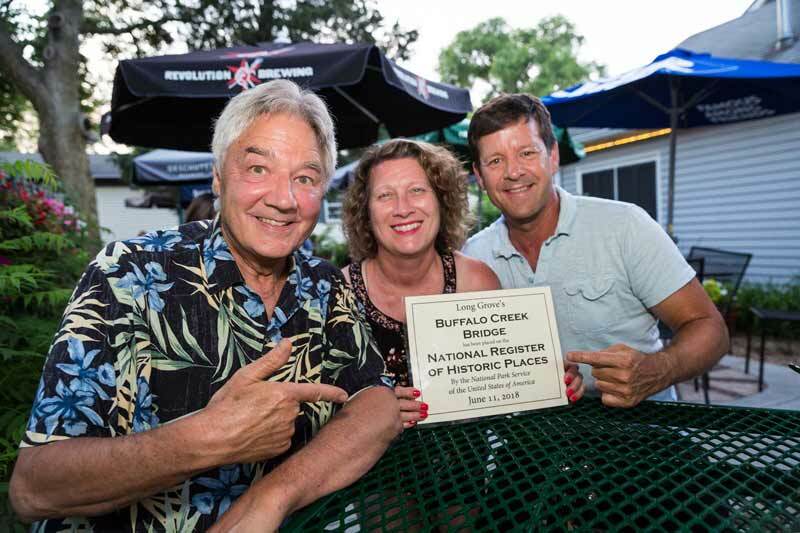 One particularly happy memory for me this past year is captured above in the photo taken just hours after receiving the news that our covered bridge in Long Grove had been officially listed on the National Register of Historic Places. The joy that I felt in that moment is something I will never forget. As we move into the new year I am looking forward to seeing progress on the restoration of our iconic bridge, so that it will last for generations to come. 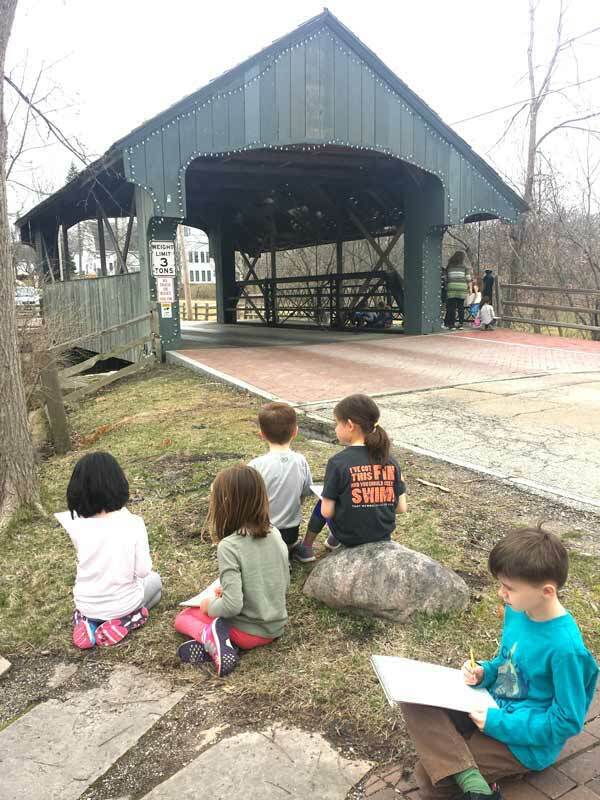 In May of this year, the Historical Society organized and sponsored a children’s art contest for entries featuring our covered bridge. Many of the local public and private schools participated, with students from the Montessori School of Long Grove shown below taking in some up-close inspiration. 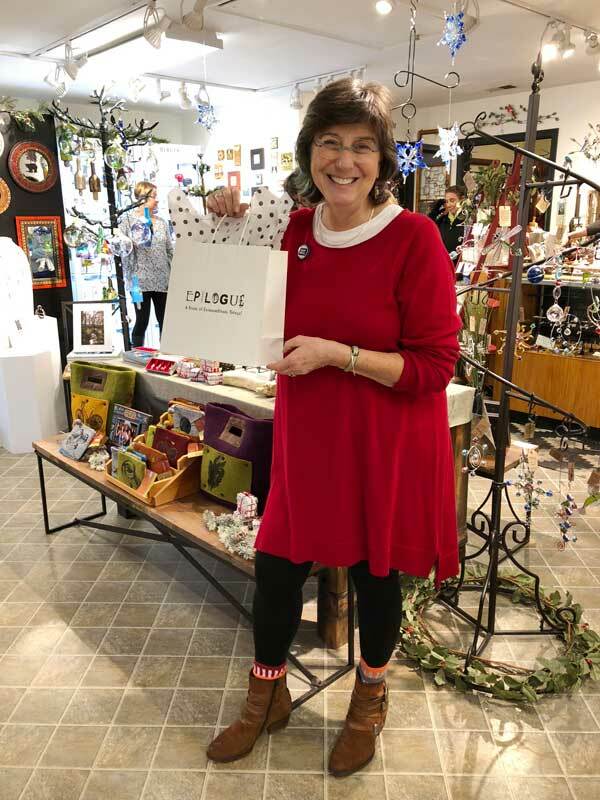 Judges from the Long Grove Arts & Music Council awarded prizes in various age categories, with winners receiving gifts donated by our generous historic downtown merchants. 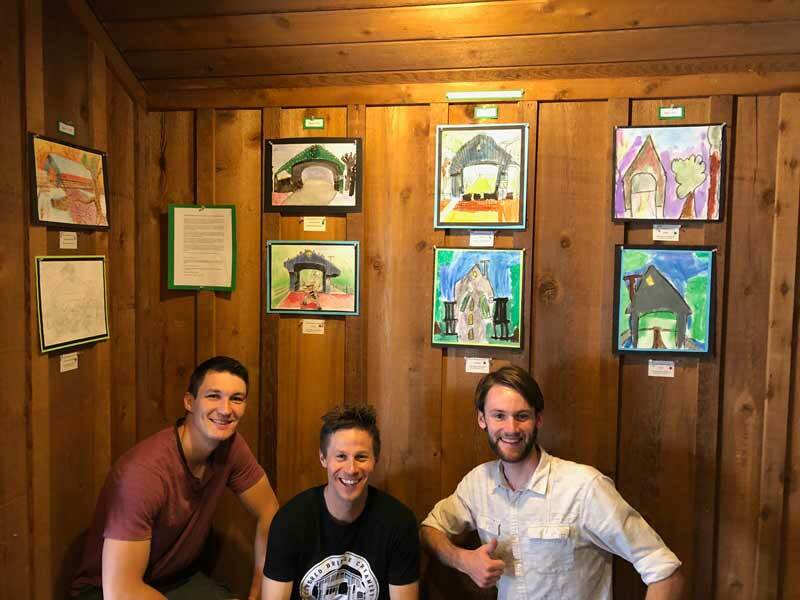 The winning entries were showcased at the Covered Bridge Creamery in late May and June. 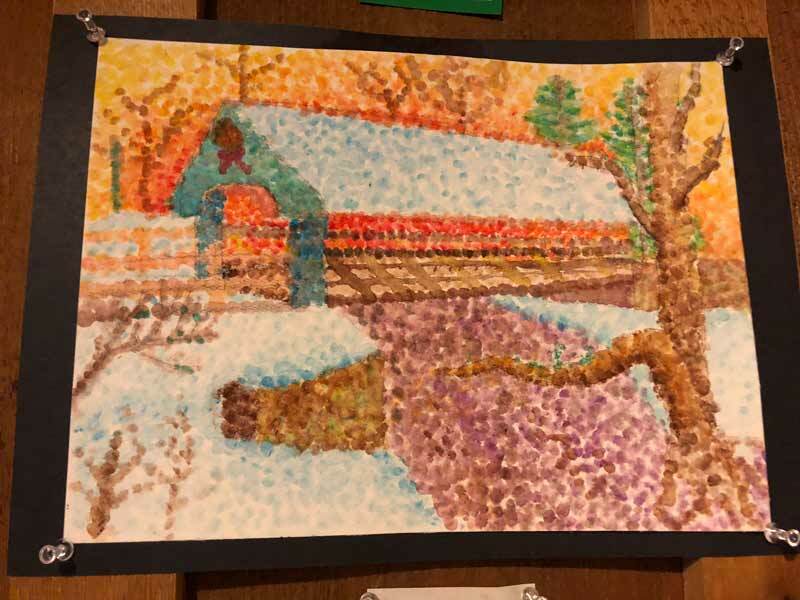 Pictured below is a lovely winter view of the bridge created by one of the students, a scene that now lives in memory but will hopefully be realized again in holiday seasons yet to come. Best wishes to Long Grove in 2019, and may the joyous memories continue! 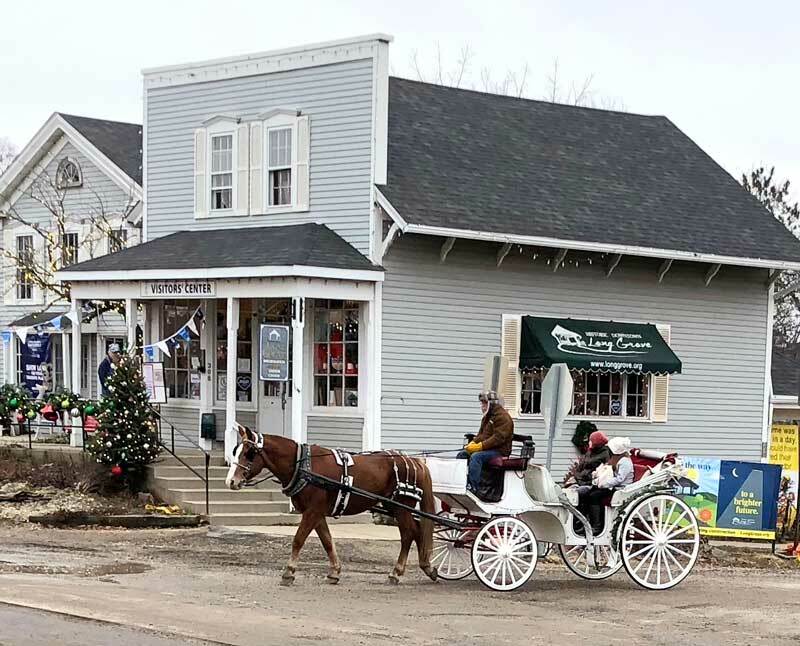 Horse-drawn carriage rides are a special treat on weekends this holiday season in Long Grove. 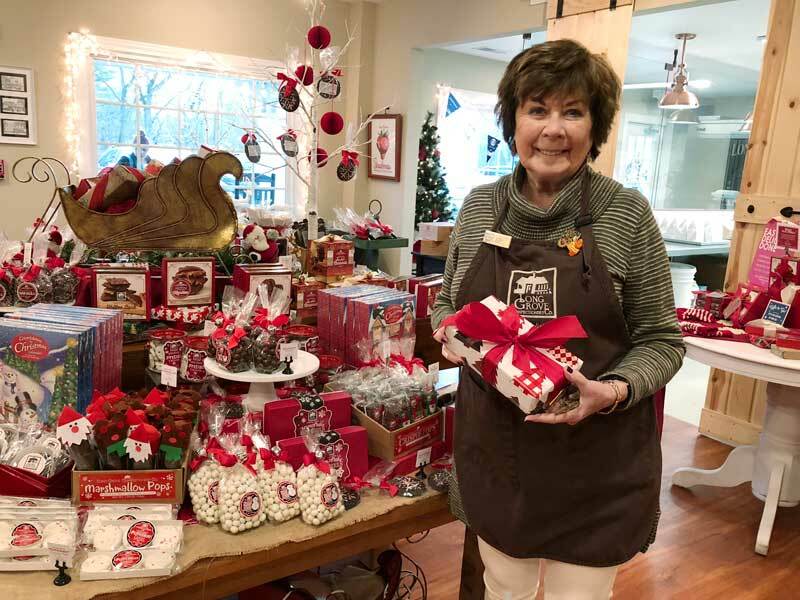 Judy, at the Long Grove Confectionery, who cheerfully wrapped my grab bag gift for the upcoming bunco party. 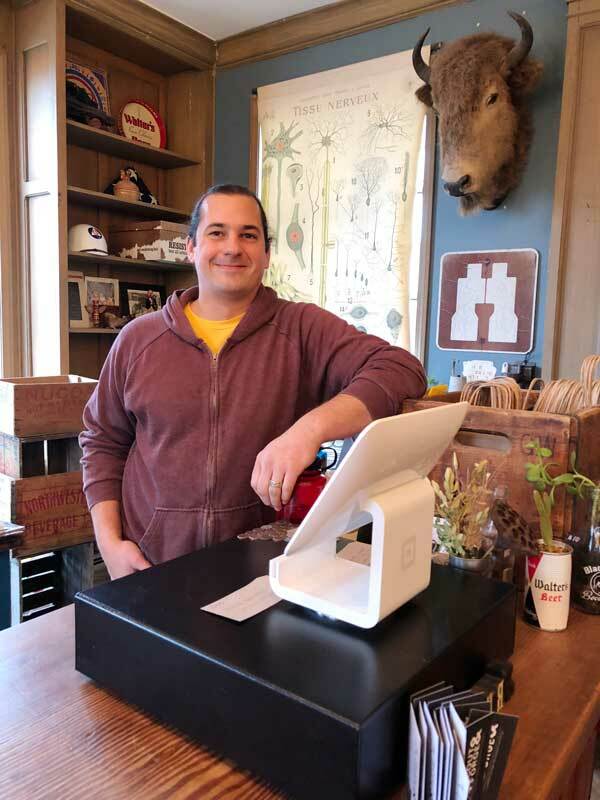 Matt, at Scout and Forge, who showed me some vintage treasures and recently became a new Dad! Rachel, at Epilogue, who helped me pick out the perfect hostess gift to bring to the cocktail party that evening. 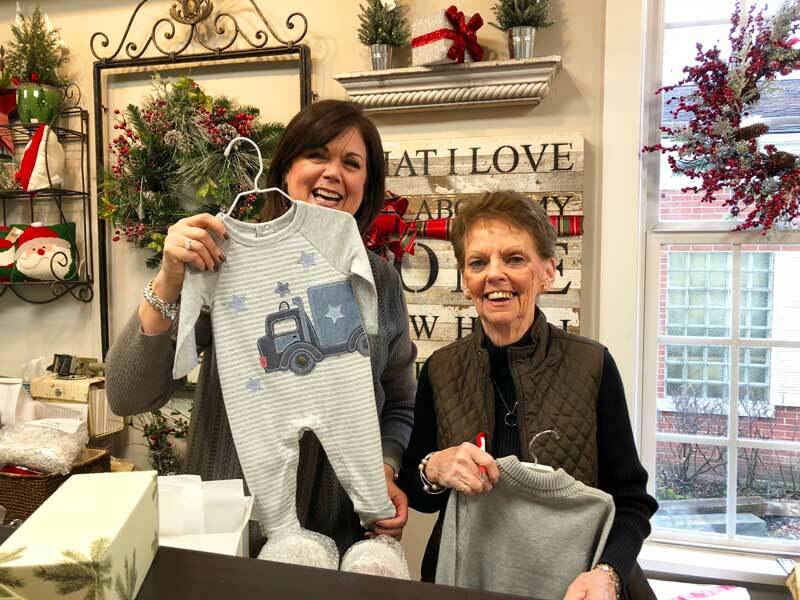 Marian, at Within Reach (on the left), who helped me select something adorable for my newborn grandson! 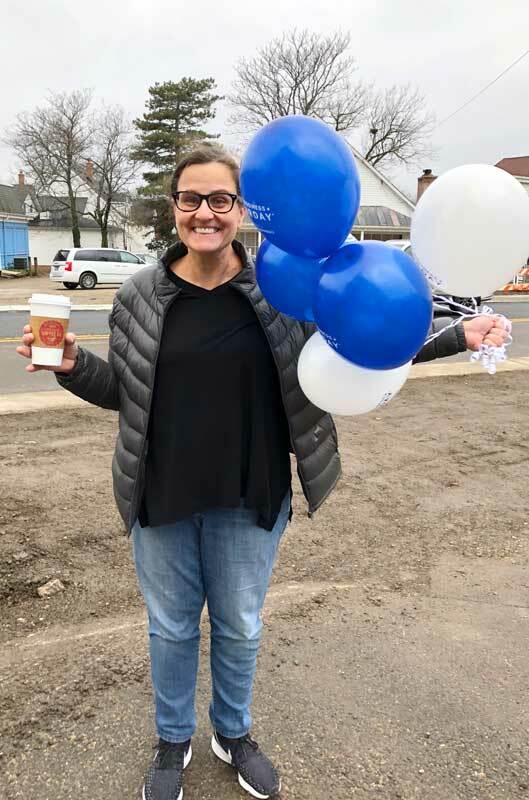 Mary, at the Long Grove Coffee Company, caught in a random act of kindness delivering Small Business Saturday balloons and a hot beverage to a fellow merchant. 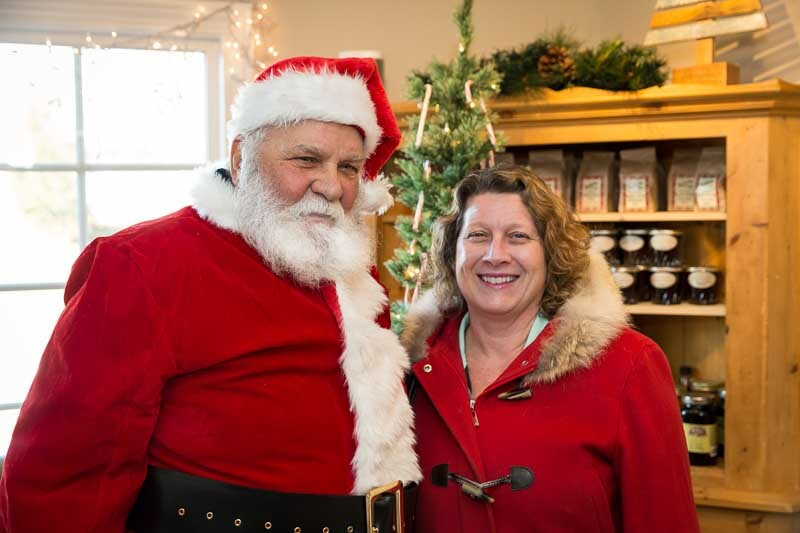 During this holiday season it’s easy to find reasons to support our local merchants. I’ll be back in the weeks ahead to dine and dance and shop with my Christmas list in hand. I encourage you to do the same! 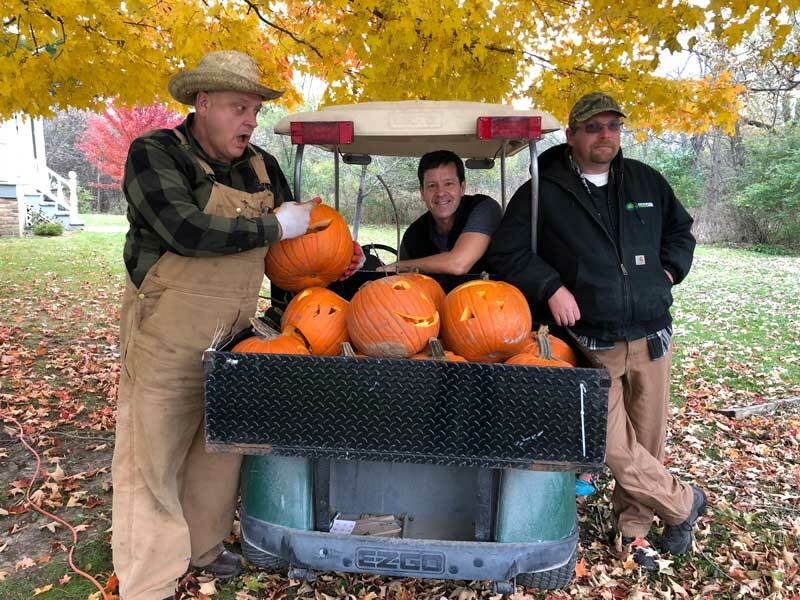 This past Friday, October 26th, things were feeling very “Halloweenish” in downtown Long Grove. Merchants hosted kids in costumes for trick-or-treating in the late afternoon, and the streets were alive with mini ghouls and ghosts sprinkled amidst the princesses and superheroes. I happened to be taking a dance lesson at Fred Astaire during this time, and it was a delight to see so many young families stopping in for candy. And hats off to the enthusiastic Dad who dressed as a purple and rainbow accessorized unicorn! 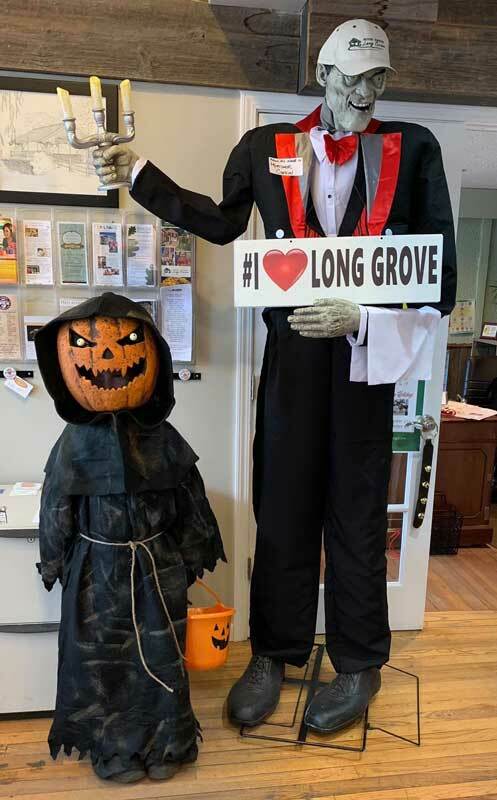 A scary but cute trick-or-treater is greeted at the Long Grove Visitor’s Center by our official Halloween host, Mortimer Coffin. Setting the scene for scary songs and stories! 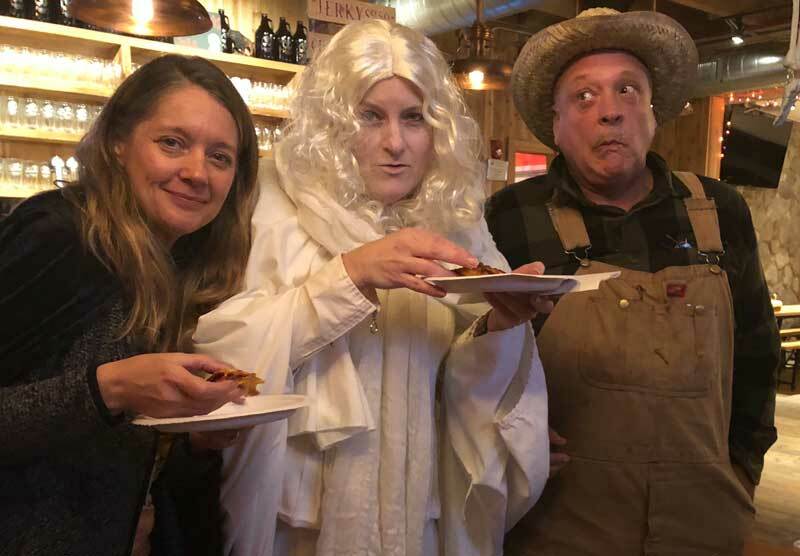 Another sighting of the Ghost occurred at Buffalo Creek Brewing following the show. Apparently, all that haunting works up a powerful appetite! Amy Gayton (L) and John Kopecky (R) join the Ghost of Cuba Road for a post-show pizza party. 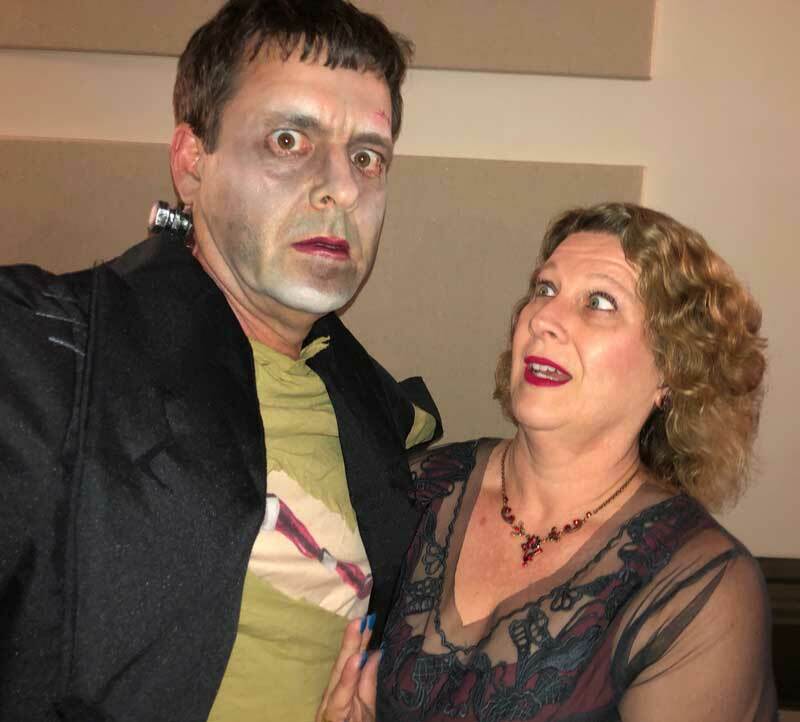 No place in Long Grove was safe, as Frankenstein was even spotted at the Dance Studio, menacing the local villagers. 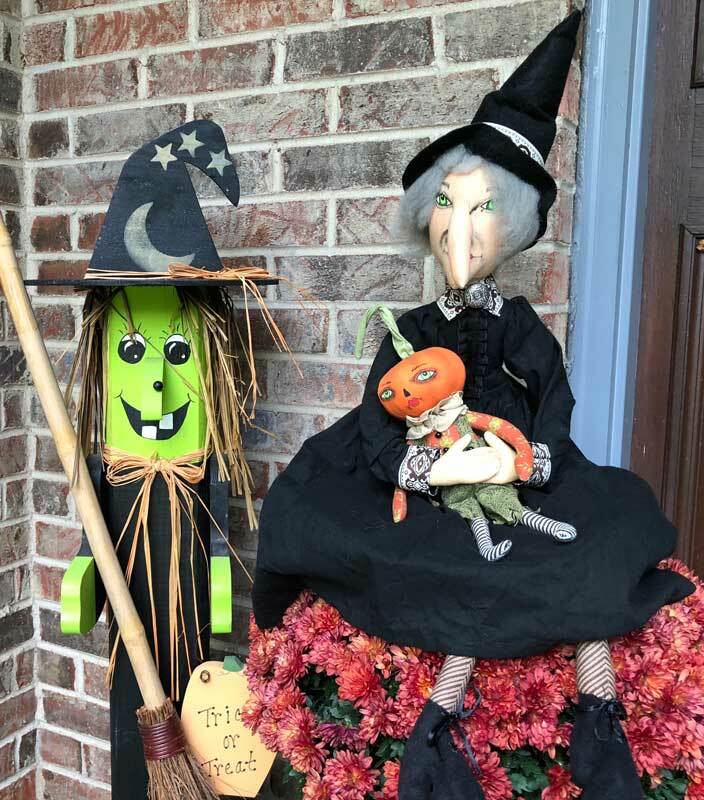 Now that Fall is in full swing and Halloween is fast approaching, downtown Long Grove has several special events planned to help get you in the holiday “spirit.” My favorite fun and creative new idea this year is Witches Night Out, being held next Thursday evening, October 18th from 5 to 8 pm. Stores in the historic downtown will be staying open late and the restaurants in town will be offering special themed menu items to taste and sip. Wear your favorite pointy hat and you might even have an opportunity to bedazzle it! I have also heard tales that fortune tellers, tarot card readers, and even an enchanted D.J. may be conjured up to add to the evening’s excitement. The spell has been cast–don’t miss this girls and ghouls gathering! Scarecrow Day: Saturday, October 13th from 11-4 outside Country House on Robert Parker Coffin Road. Bring your own clothes and props and for a $5 donation you will receive the supplies and help to create an original scarecrow masterpiece. Trick or Treating: Friday, October 26th from 2-5. Dress your little ones in costume and trick or treat at the downtown Long Grove stores and businesses. Parents can register for a prize drawing at the Information Center. A Scary Night at the Farmhouse: Friday, October 26th from 7-7:45 pm at the Historical Society Farmhouse. Enjoy a family friendly Halloween themed variety show and sing-a-long outdoors on the back porch patio. 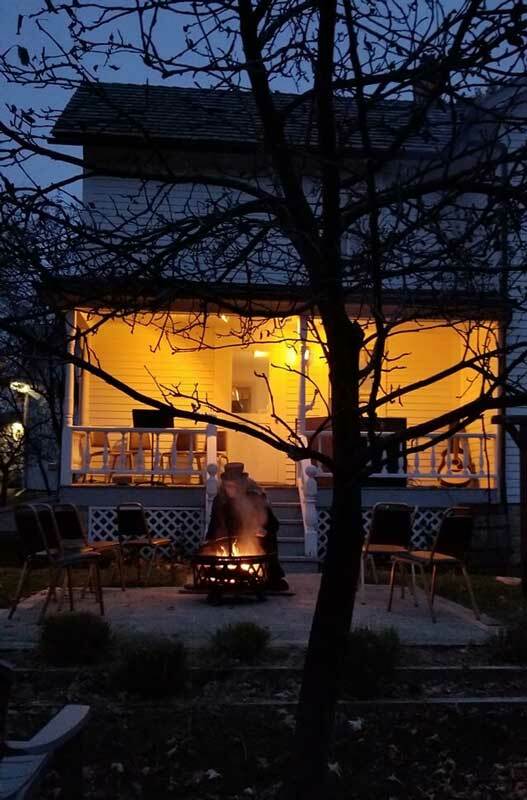 Fire pits will provide some warmth and be sure to bring your folding chairs. Spooky stories and songs to delight all ages. Halloween Pet Parade: Sunday, October 28th from 12-4:30. Dress your furry friend in their most adorable costume–prizes will be awarded! 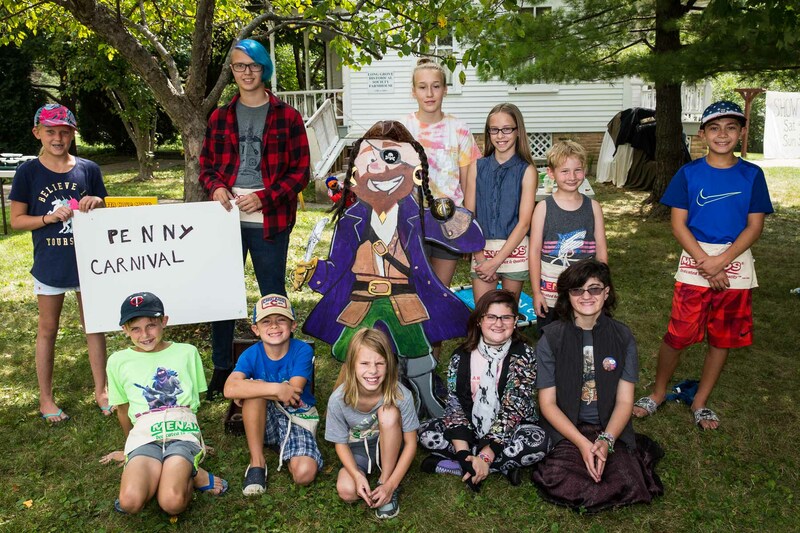 Pictured above are many of the awesome local kids who volunteered to help run the games for the younger kids at the Historical Society Penny Carnival. I grew up in small town America. The Central Illinois farming community where I was born has a population of only 2,000 and a Main Street lined with historic buildings and a vintage train depot. 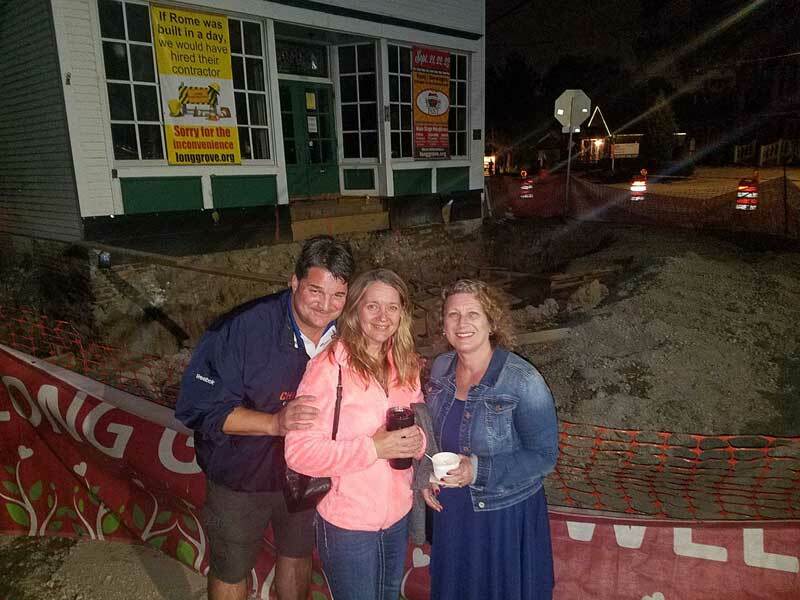 Even though Long Grove is a suburb of Chicago, and with it’s 8,000 residents is quadruple the size of my hometown, there are times when it truly feels like a close-knit village. Case in point–our recent Vintage Days weekend. The Historical Society sponsored two family events run by kids, for kids, and it was heartwarming to be part of the festivities. 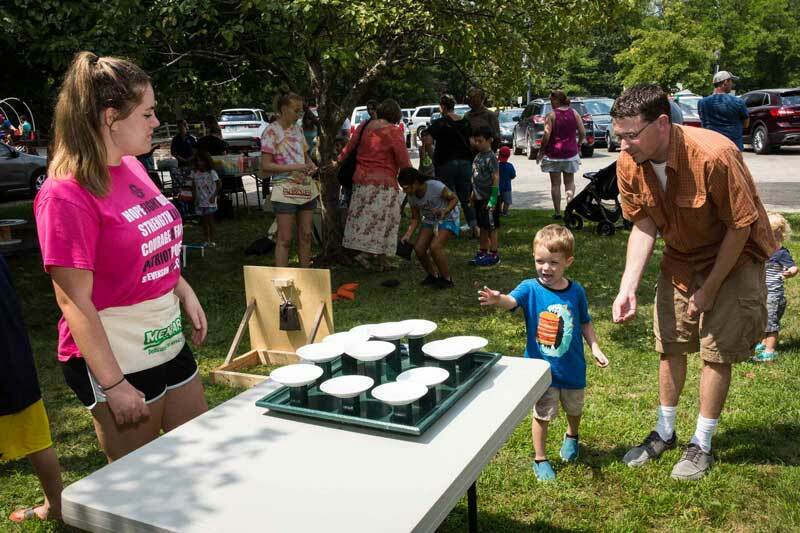 What’s a Penny Carnival without a penny pitch game? 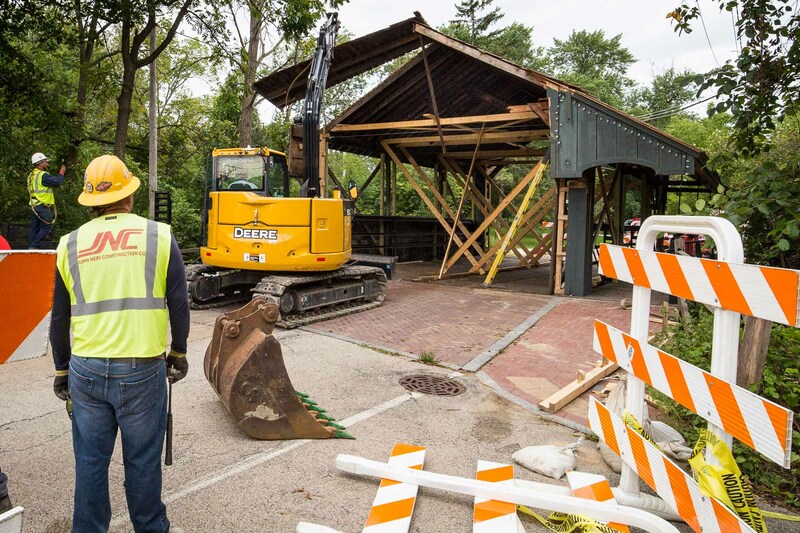 The demolition crew started bright and early this morning on removal of the damaged wooden canopy over the Long Grove bridge. It was a bittersweet moment today watching the remains of the covered bridge being dismantled. Feeling sad as I gathered early this morning with members of the Historical Society, Arts & Music Council, and downtown merchants, it was a comfort to see the care being taken by the demolition crew to salvage as much of the original boards as possible. Village staff has arranged for storage of the old wood and the local non-profits are hopeful that they will be allowed to re-purpose it to benefit our Village and commemorate the bridge’s historical significance. The demolition is expected to be completed this coming Monday, September 10th. Temporary clearance bars are planned to be installed on both sides of the bridge in addition to jersey barriers. This is to keep overweight and over-height vehicles and trucks from using the bridge and causing damage to the historic metal supports and foundations. Once these measures are in place IDOT engineers will inspect the bridge and if all goes well it could be opened to vehicular and pedestrian traffic as early as next week. In the months ahead the Village Board will be considering bids for the reconstruction of the wooden covering, which is likely to occur in the spring of 2019. With the bridge covering two-thirds removed, the historic iron truss and walkway begin to emerge and become more visible. 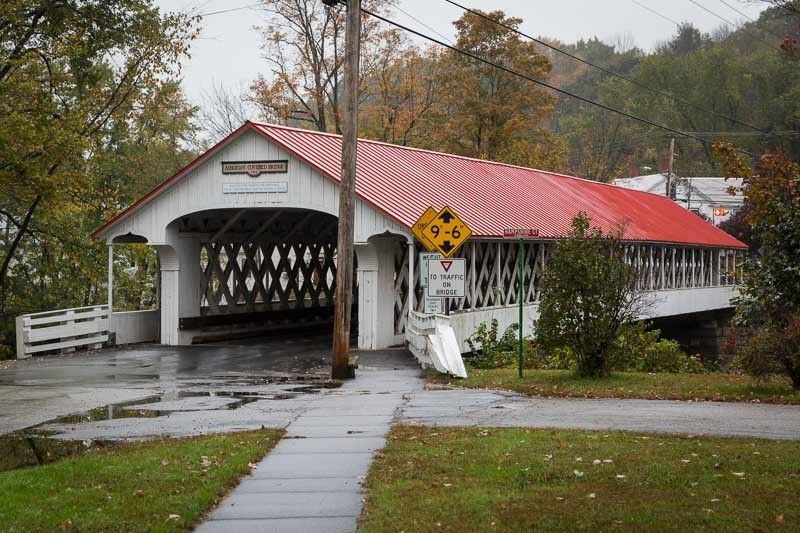 With the covering gone on the majority of the bridge, the original 1906 Pratt Pony truss and walkway is now fully visible and no longer partially hidden by the wooden “hat” it was given in 1972. The historical elements that qualified our bridge for federal recognition are now on glorious display. As I snapped a few additional photos I chatted with shop owners, Montessori school moms, neighbors, friends, and the Village Engineer who all joined in with me to admire the beautiful ironwork from a century past. 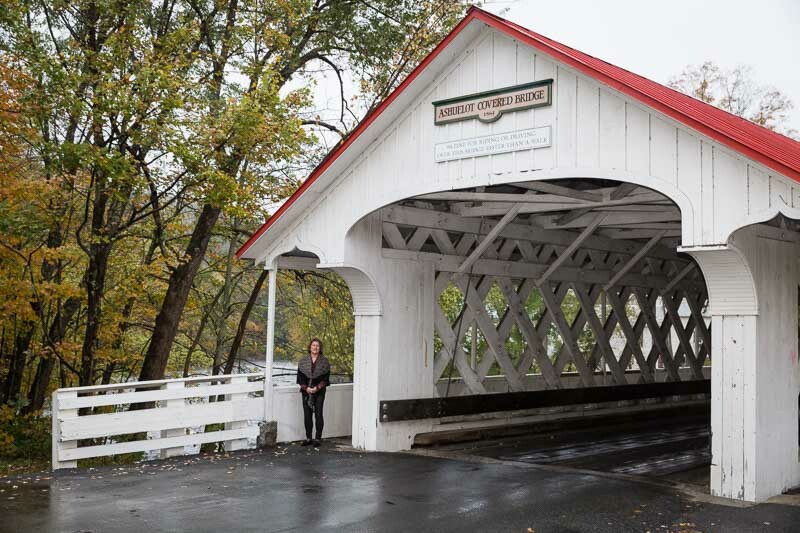 The real treasure of our covered bridge is still intact. The wooden covering will be rebuilt in a matter of months. 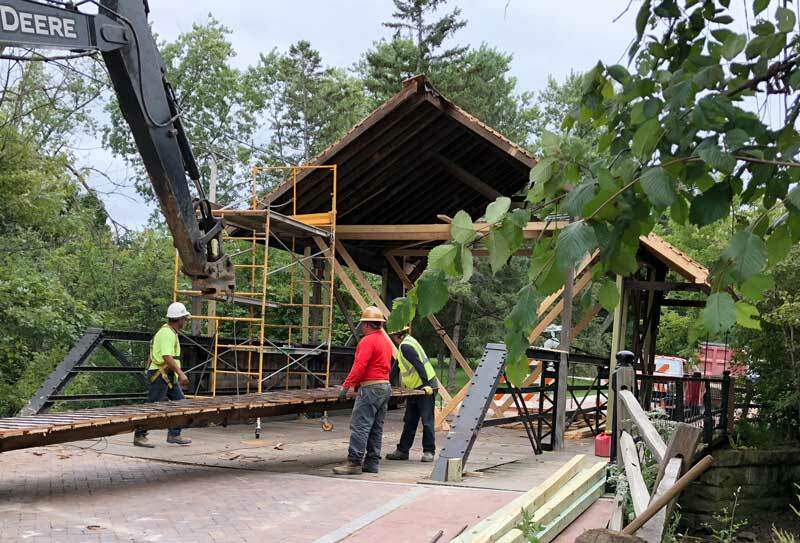 The demolition this morning is really just the first step towards another century in the life of our iconic covered bridge, with a special inner beauty shining most vividly today. Notice a picture of our Long Grove Village Hall on the upper right of the cover of the Muttersholtz municipal newsletter. Earlier this summer I was contacted by Martine Kilcher, the Deputy Mayor of the town of Muttersholtz, France. She was putting together a feature for their September, 2018 municipal newsletter on places around the world that have a special connection or “twinning” with their village. 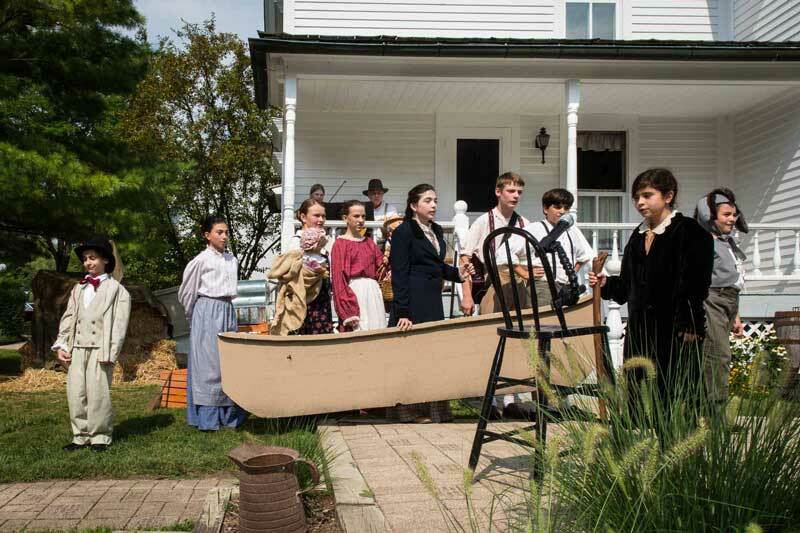 Long Grove was founded in part by descendants of settlers from Muttersholtz in the mid-1800’s, and went by that name for several years before officially becoming the Village of Long Grove. I was glad to be able to write a short piece about our history and current events, and provide a few pictures for our friends in Europe to see what our village in America, inspired by Muttersholtz, looks like today. From Martine I learned that Muttersholtz is also very ecology minded, even receiving a special designation for this. Our villages both share a historic downtown crossroads with vintage buildings, and have had local craft breweries open in the past few years. It was a delightful experience to connect with Martine and we have even kept up with each other’s organizations through Facebook. 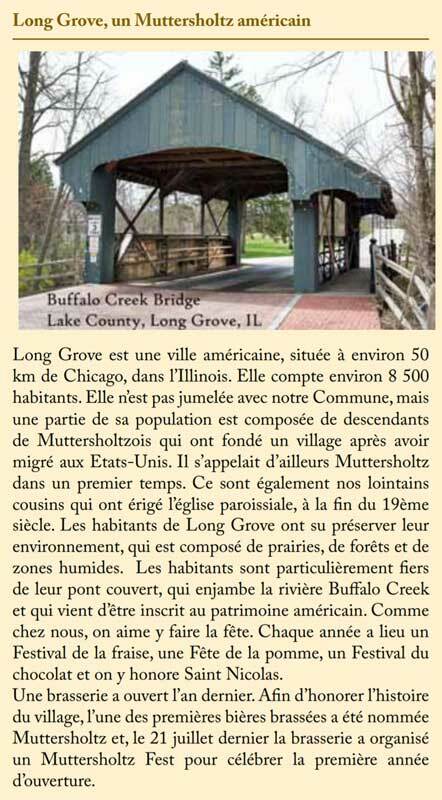 When our covered bridge was listed on the National Register our Historical Society received congratulations from France, and when it was damaged a few weeks later they shared in our sorrow. 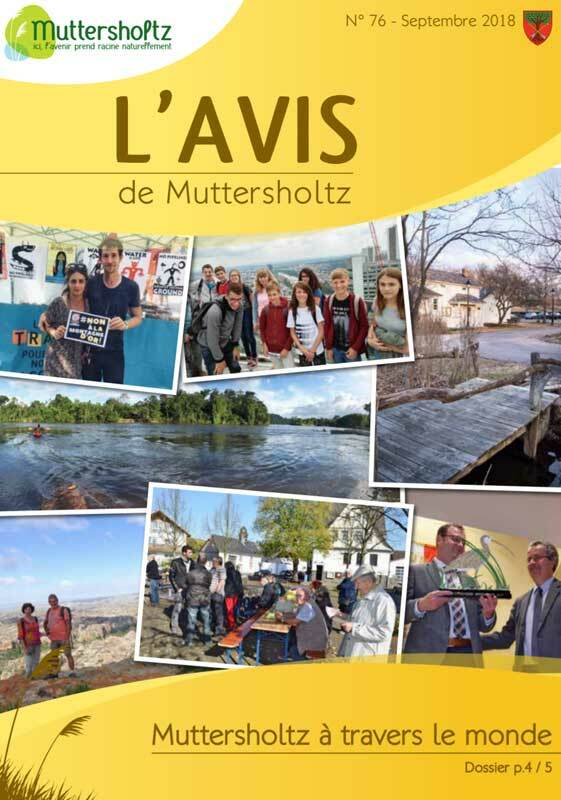 To learn more about Muttersholtz, France click on this link.